Please bring your own water, as potable water is not available in the park. Volunteers from the Caledonia Ramblers Hiking Club cleared the fallen trees from Bobtail Mountain Trail. BC Parks would like to thank the Caledonia Ramblers for all their hard work in keeping the trail clear in Bobtail Mountain Provincial Park and other parks throughout the region. The trail conditions are fair with some wet and boggy sections. Gregg Creek Forest Service Road is rough with potholes and logging activity; please use caution when traveling the road. Bobtail Mountain Road is in fair condition from the turn off from the Gregg Creek Forest Service Road at 23.5 km to 5 km where the bridge has been removed. Please park appropriately at this location to allow other users access to the area. Use caution when crossing the creek. Due to rapid deterioration, the bridge 2 km from the parking lot has had to be removed. Sorry for any inconvenience this may cause, but please note that this will add 2 km to the hike each way. Designated in June 2000, this 1,360 hectare park features an unusual outcropping of serpentine rock. The Bobtail Mountain trailhead is southeast of the park. This forest service trail is about 5 km in length with a change in elevation of 470 metres. 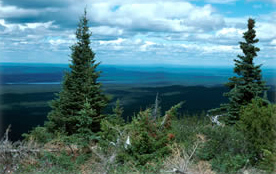 It meanders up along the southern park boundary to a south facing viewpoint at the summit of Bobtail Mountain, ending at a north facing viewpoint where a small hut has been built to provide shelter. There are no other facilities provided. This 5 km trail (one-way) is marked by red paint and flagging. The trail starts with a short climb, thereafter continuing with gentle ups and downs. Along the way there are two short side trails leading to south-aspect viewpoints. The first is the actual summit of Bobtail Mountain. The trail ends at a view point where there is a cabin suitable for day-use. There is no water or stove; therefore the cabin is unsuitable for overnight use. The view point provides good views NW towards Norman Lake. For your own safety and the preservation of the park, obey posted signs and keep to designated trails. Shortcutting trails destroys plant life and soil structure. There is seasonal hunting allowed in this park. Please check the Hunting and Trapping regulations for more information. During the summer, at the summit of Bobtail Mountain there is a cabin/shelter suitable for day-use only, on a first-come first-served basis. There is is no fee.